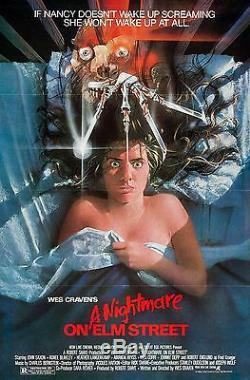 A Nightmare on Elm Street (1984). Heather Langenkamp, Johnny Depp, Robert Englund. Size: 27 x 41 inches (68.58 cm x 104.14 cm). Condition: near mint and unused. The item "A NIGHTMARE ON ELM STREET (1984) ORIGINAL MOVIE POSTER TRI-FOLDED" is in sale since Saturday, January 19, 2019.